"Guerrilla" and "Guerrilla War" redirect here; they are not to be confused with Gorilla. For other uses, see Guerrilla (disambiguation). The term, the diminutive form of "war" in Spanish, is usually translated as "little war", and the word, guerrilla (Spanish pronunciation: [ɡeˈriʎa]), has been used to refer to the concept since the 18th century, and perhaps earlier. In correct Spanish usage, a person who is a member of a guerrilla is a guerrillero ([ɡeriˈʎeɾo]) if male, or a guerrillera if female. 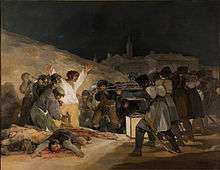 This term became popular during the early-19th century Peninsular War, when the Spanish people rose against the Napoleonic troops and fought against a highly superior army using the guerrilla strategy. It is often misunderstood that guerrilla warfare must involve disguising as civilians to cause enemy troops to fail in telling friend from foe. However, this is not a primary feature of a guerrilla war. This type of war can be practiced anywhere there are places for combatants to cover themselves and where such advantage cannot be made use of by a larger and more conventional force. While the tactics of modern guerrilla warfare originate in the 20th century, irregular warfare, using elements later characteristic of modern guerrilla warfare, has existed throughout the battles of many ancient civilizations but in a smaller scale. This recent growth was inspired in part by theoretical works on guerrilla warfare, starting with the Manual de Guerra de Guerrillas by Matías Ramón Mella written in the 19th century and, more recently, Mao Zedong's On Guerrilla Warfare, Che Guevara's Guerrilla Warfare and Lenin's text of the same name, all written after the successful revolutions carried by them in China, Cuba and Russia respectively. Those texts characterized the tactic of guerrilla warfare as, according to Che Guevara's text, being "used by the side which is supported by a majority but which possesses a much smaller number of arms for use in defense against oppression". One of the most remarkable guerrilla warfare warriors was Viriatus, a Lusitanian who led the resistance against the Roman Empire by obtaining several victories between 147 BC and 139 BC in the region of Zamora, Spain. Because of the innovative tactics he used during his command, he made himself the name of Terror Romanorum (Terror of the Romans). Another notable example of guerrilla warfare was during the 17th century in India when the Marathas under the leadership of Shivaji attacked the surrounding kingdoms of Bijapur Sultanate and Qutub Shahi Empire, which had a numerical advantage and huge armies, but little knowledge of the geographical layout of the Western Ghats and the Deccan Plateau. He assembled small armies and constantly raided the military camps and won numerous battles even with insignificant numbers. 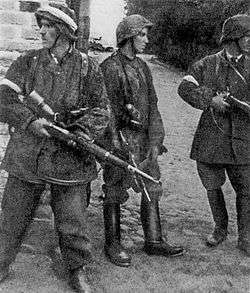 Polish guerrillas from Batalion Zośka dressed in stolen German uniforms and armed with stolen weapons, fighting in the Warsaw Uprising. A counter-insurgency or counterinsurgency (COIN) operation involves actions taken by the recognized government of a nation to contain or quell an insurgency taken up against it. 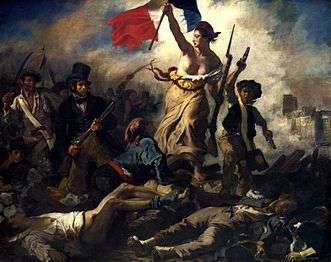 In the main, the insurgents seek to destroy or erase the political authority of the defending authorities in a population they seek to control, and the counter-insurgent forces seek to protect that authority and reduce or eliminate the supplanting authority of the insurgents. Counter-insurgency operations are common during war, occupation and armed rebellions. Counter-insurgency may be armed suppression of a rebellion, coupled with tactics such as divide and rule designed to fracture the links between the insurgency and the population in which the insurgents move. Because it may be difficult or impossible to distinguish between an insurgent, a supporter of an insurgency who is a non-combatant, and entirely uninvolved members of the population, counter-insurgency operations have often rested on a confused, relativistic, or otherwise situational distinction between insurgents and non-combatants. 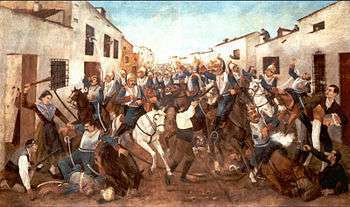 Theorists of counter-insurgency warfare have written extensively on the subject since the 1950s and 1960s but as early as the 1720s the third Marques of Santa Cruz de Marcenado (1684–1732) wrote that insurgencies were often the result of state failure and that the goal of those fighting the insurgents should be to seek the people's "heart and love". The two most influential of scholars of counter-insurgency have been Westerners whose job it had been to fight insurgents (often colonized people). Robert Thompson fought during the Malayan Emergency and David Galula fought during the Algerian War. Together these officers advocated multi-pronged strategies to win over the civilian population to the side of the counter-insurgent. In the Vietnam War, the Americans "defoliated countless trees in areas where the communist North Vietnamese troops hid supply lines and conducted guerrilla warfare", (see Operation Ranch Hand). In the Soviet war in Afghanistan, the Soviets countered the U.S.–backed Mujahideen with a 'Scorched Earth' policy, driving over one third of the Afghan population into exile (over 5 million people), and carrying out widespread destruction of villages, granaries, crops, herds and irrigation systems, including the deadly and widespread mining of fields and pastures. Some writers on counter-insurgency warfare emphasize the more turbulent nature of today's guerrilla warfare environment, where the clear political goals, parties and structures of such places as Vietnam, Malaysia, and El Salvador are not as prevalent. These writers point to numerous guerrilla conflicts that center around religious, ethnic or even criminal enterprise themes, and that do not lend themselves to the classic "national liberation" template. In the 1960s, the Marxist revolutionary Che Guevara developed the foco (Spanish: foquismo) theory of revolution in his book Guerrilla Warfare, based on his experiences during the 1959 Cuban Revolution. This theory was later formalized as "focalism" by Régis Debray. Its central principle is that vanguardism by cadres of small, fast-moving paramilitary groups can provide a focus for popular discontent against a sitting regime, and thereby lead a general insurrection. Although the original approach was to mobilize and launch attacks from rural areas, many foco ideas were adapted into urban guerrilla warfare movements. 1 2 McNeilly, Mark. Sun Tzu and the Art of Modern Warfare, 2003, p. 204. "American arming and support of the anti-Soviet Mujahadeen in Afghanistan is another example." ↑ Mao Tse-tung, "A Single Spark Can Start a Prairie Fire", Selected Works, Eng. ed., FLP, Peking, 1965, Vol. I. ↑ Guevara, Ernesto; Loveman, Brian; Thomas m. Davies, Jr (1985). Guerrilla Warfare. ISBN 9780842026789. ↑ Leonard, Thomas M., Encyclopedia of the developing world, 1989, p. 728. "One of the earliest proponents of guerrilla war tactics is the Chinese master of warfare, Sun Tzu." ↑ Snyder, Craig. Contemporary security and strategy, 1999, p. 46. "Many of Sun Tzu's strategic ideas were adopted by the practitioners of guerrilla warfare." ↑ Snyder, Timothy. "Holocaust: The Ignored Reality"
↑ Failoa, Anthony (13 November 2006). "In Vietnam, Old Foes Take Aim at War's Toxic Legacy". The Washington Post. Retrieved 31 October 2011. ↑ Kilcullen, David. "Counter-insurgency Redux"